I read this article and found it very interesting, thought it might be something for you. The article is called Cauliflower Hash + A Beautiful Experience at a Syrian Restaurant in Kuwait and is located at https://www.anediblemosaic.com/cauliflower-hash-a-beautiful-experience-at-a-syrian-restaurant-in-kuwait/. Syrian or Lebanese?, Mike asked me late one evening, wondering what I was in the mood for. Syrian! A glimmer in my eyes, I replied instantly, already excited at the prospect. That night, Mike and I were going out to dinner with one of his friends that he had reconnected with since we moved here. Life is funny like that…reconnections from our past are unexpectedly interwoven with new experiences. As we drove to the restaurant through the dusty, crowded streets of Kuwait I had no idea the desert oasis that awaited us. The lot was so full we had to park the car at the end, in a spot that wasn’t really a spot, half of the car on the pavement and the other half in the surrounding sandy soil. We walked through the parking lot and up the steps of the restaurant, and I couldn’t help but feel as though we were transported to Damascus. A beautiful stone geometric star-shaped pool inlaid with a mosaic design like those found in Al Azem Palace in Damascus sat outside, the sound of its gurgling water creating a calming mood and the slight mist it gave off refreshing those passing by. I don’t know if it was my imagination, but I could have sworn I smelled jasmine. We walked in and the first thing I noticed was how spacious it was. It looked like a Damascene courtyard. There were more fountains and the walls were decorated in the ablaq architectural style of rows of fluctuating dark and light-colored stone that is so popular in Damascus. High ceilings, comfortable chairs, linen tablecloths. The atmosphere welcomed us in and we felt at home. Our wait staff wore what Mike told me was traditional Syrian attire; they were all male, but quite diverse despite that, saying they were from Palestine, Egypt, and a few other places that escape my memory now. And friendly. They were so friendly. Mike chatted with them in Arabic, talking and laughing, especially with our main waiter – who, like Mike’s father, is from Palestine – for a good long while. Seconds after being seated we were greeted with cool water and flatbread served with two dips: one thick, creamy, and yogurt-based with cucumber and mint, and the other green olive-based and more like tapenade. Hot bread on a huge round wicker tray was always being brought by our table. Any time I’d politely decline, saying I still have bread, the waiter would insist, pointing to a round loaf and saying, But this is hot! How could I resist steaming hot, fresh bread? I couldn’t. And it didn’t need hummus, labneh (yogurt cheese), or anything else to be completely delicious. The salads and appetizers arrived, and the wait staff served us our portions at the table. I think the waiter must have been nervous because half of the tabbouleh that was meant for my plate ended up on the table beside it. He looked mortified, and I brushed it off, saying I do that all the time at home. He smiled. Another of our waiters looked just like a young President Obama. I told Mike and Mike told the waiter, who beamed a brilliant white smile as if we had just handed him a huge check. It totally made his day. The fattoush was perfect, fragrant and full of whole herb leaves that I could recognize and a few I couldn’t. The tabbouleh was just as tabbouleh should be: tart, crisp, and all about the pretty parsley chiffonade. The hummus was light and creamy. I had Fatayer bil Sabanekh (spinach pies) as my main, and I was perfectly satisfied without meat. Mike ordered half a chicken cooked over charcoal and his friend ordered chicken kebabs. Being offered tastes of each, I tried everything. It was all outstanding. The chicken kebabs reminded me of the ones my beautiful Syrian mother-in-law Sahar made for me one night when we were visiting Mike’s family while they were still in Damascus. We were grilling and everyone else was having lamb kebabs, but Sahar knew I don’t eat a lot of red meat and much prefer chicken, so she made them special. She’s incredibly thoughtful like that. Mike and his friend both smoked fruit-scented tobacco hookahs after dinner; Mike, as always, had apple (toofah) and his friend had grape (ainab). I sipped strong mint tea. Mike’s friend brought over a beautiful plate of sweets from the dessert buffet. I wish that I had room to indulge because they looked divine. A while later, our head waiter came by and with a big smile, whispered something into Mike’s friend’s ear. There was some disagreement and then nodding. The waiter walked away and Mike asked what he had said. Everything is on the house, his friend replied with a look of astonishment. We were touched. This is the Syrian hospitality that I remember so fondly during my time in Damascus. The thoughtfulness, welcoming attitude, and being nice just for the sake of being nice that I have seen time and time again exhibited in Syria’s beautiful people. I don’t know if I’ve ever mentioned it on my blog, but back when Mike and I were first married and we were on our honeymoon in Damascus we were out shopping one evening at Souk al Hamidiyah and wanted to grab a taxi home, but it was getting late and we were having trouble finding one. Finally a taxi pulled over, but the driver had his sleeping daughter, who looked about two years old, in the backseat. He asked if this was ok and we said it was; I was careful not to disturb her in the backseat and Mike took the passenger seat in the front. Mike and the driver chatted about life in Syria and how the driver was having trouble making ends meet. He asked about Mike and I, and Mike happened to mention in passing that I was from the US. The chatter continued the entire way. When we pulled up to our destination, the driver absolutely refused payment from us, saying we were travelers there and guests in his country, as if he had been the very one to invite us. The driver, a perfect stranger, who was having trouble making ends meet and had a little girl and a wife to feed. I was speechless. I know these are not anything close to the stories of Middle Eastern brutality that you hear on the news – they are quite the opposite, actually; but these are, in fact, my own firsthand Middle Eastern experiences. And I thought you had the right to know. As I sat in that breathtaking Syrian restaurant that truly was a little slice of Damascus here in Kuwait, I choked back a lump in my throat as I thought of Syria now. If you know someone who is Syrian, I want to tell you that even if they are away from immediate danger and aren’t in Syria, even if their immediate family isn’t in Syria, and even if they don’t talk about Syria often, their heart is probably broken for their ravaged homeland. Show them a little extra kindness and keep them in your thoughts and prayers; knowing the kind-hearted nature of Syrians, I’m sure they’d do it for you in return. So, what does this Cauliflower Hash have to do with Syria or with that experience? Not much, save one thing. Like the cuisine of Syria that I have grown so fond of, this meal is a celebration of a few simple, unadorned flavors that shine brilliantly when they’re combined. This meal isn’t fancy or pretentious; it’s nourishing, delicious comfort food, or what I like to call Syrian-style comfort food. Add a fried or poached egg on top and it’s a full meal that doesn’t get any better. Enjoy it with someone you love. Heat the oil in a large skillet over medium-high heat; add the cauliflower and onion in an even layer and let it cook without stirring until it takes on a little color on the bottom, about 2 to 3 minutes. Give it a stir, then add the smoked paprika, salt, black pepper, and water. Cover the skillet and cook until the cauliflower is fork-tender but not mushy, and has taken on a golden color, about 3 to 5 minutes. Turn the heat down to low, add the garlic, and cook 2 minutes, stirring constantly. Stir in the lemon juice and cook until evaporated, about 30 seconds. Serve with the parsley sprinkled on top, and add a fried egg if you like. P.S. I’m hoping to return to that beautiful restaurant soon and take pictures of everything to share with you! Healthy, light and really tasty! My kind of meal. What a beautiful story Faith – thanks for sharing your experience. I pray for peace. The simplicity of your cauliflower hash is so comforting. Wow, thank you so much for sharing this story. We never get to hear these personal stories, especially about the food, the people, etc. It’s all just the grossness of war. It makes me tearful reading this. And i concur about how different the experience that I had, as compared to what is happening now. I hope you enjoy Kuwait, and show us more glimpses of new life here on the blog! I love stories about the kindness of strangers! Your hash looks so tasty. Beautiful story Faith…very typical of people of the Middle East and is something that the world needs to know. Media distorts so many things and we rarely hear about the goodness of the people in the Middle East. I remember watching a story on TV about a man who travelled around the world without spending any money and he said the easiest place to live in was the Middle East b/c of their kindness. May Allah ease the suffering of the people in Egypt and Syria. By the way the hash looks wonderful…will try soon! Magical story. I just contributed money to a Syrian relief fund, and honestly, it is hard for me because my only source of income is Disability. You gave me such a beautiful sense of the people and the culture, and I know that future contributions will be based less in a sense of duty and more from a place of gratitude and appreciation. I know I sound like a sap saying this, but thank you for helping me be less greedy. What beautiful stories you have to share, and you are able to deliver them perfectly. You made me feel the lump in my throat :-) I am so happy you and Mike are getting to have these incredible experiences together! Very beautiful post. Thank you for writing it. I agree that the hospitality and genuine kindness of people in the Middle East is unmatched, and the depiction of Arabs in the media is far from reality. May God protect the Syrians and all those who are suffering such atrocities. Beautiful story, my husband is of Lebanese descent, we live in an area in MA, where everyone for the next two streets is either Lebanese or Syrian, so I really enjoyed your view of the warm and welcoming people of the Middle East. Great story, Faith. I feel so badly for the people of Damascus. Just saw a picture of a part of the beautiful city in ruins… how can this happen. What should we do, if anything? It’s a horrible tragedy. Thousands of years into civilization, we have progressed so little. This is such a wonderful and very timely post. What a lovely story about the taxi driver. 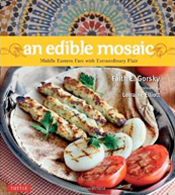 This dish is lovely, too, but I really liked reading about the Middle East and your experiences. this story is a heartwarming one, and yes, quite different from what we generally hear. thank you for sharing it. I WILL be making this hash – I love cauliflower and the flavors sound phenomenal! This hash looks fantastic, as cauliflower is one of my favorite veggies that I don’t get to enjoy nearly enough! On a side note, I had no idea you moved to Kuwait! Are you there permanently or is this a temporary move? I hope everything is going great for you! We have been keeping Syria in our prayers. I just clicked on this recipe because of the title, and so glad I did to be warmed by this beautiful story. Thank you for telling how it is (was?) in Damascus. Syrians have, for so long, been misrepresented by the media. I lived half my life there and long for the day I can go back to my adopted homeland. Preparing Syrian dishes brings comforting memories. Plus folks in the US love to join me for these culinary delights! I’ve also had this dish with cilantro instead of parsley. Both are nice, although I prefer the latter. Thanks for the Cauliflower recipe. I greatly enjoyed your story about hospitality. The Arab world in general has, sadly, gathered a rather tarnished image in the West. My personal experience mirrors much of what has been written here and it’s good to see the word passed around; perhaps food is a good vessel to transport a more accurate image !!! A touching story. Yes the Syrians were a refined sophisticated culture like the Persians. The dish is just lovely. Was looking for something different and came across this. Absolutely love it. A simple elegant meal. A great recipe. BUT it will be , no it IS, a better recipe by eliminating the lemon juice. It was extremely too bitter. Larry, I make this dish at least once every other week (it’s a family favorite) and I’ve never had 2 teaspoons of lemon juice make this dish bitter; it just brightens up the flavor and makes all the other flavors going on in the dish pop. But I do have a couple tips…I always use fresh lemon juice (never the stuff from a bottle), so if you used lemon juice from concentrate I would highly recommend trying it again with fresh juice. Also, like the recipe says, be sure to let the lemon juice evaporate off before removing it from the heat. I hope this helps and thanks for trying this dish! This is just such a lovely, moving post. That’s all. Planning on trying this next time I get cauliflower! Thank you for sharing your beautiful stories – I needed to read them this morning and I am so glad that I got a reminder there is so much good in the world along with a promising recipe to try! I’m more curious about that -perfect- egg. I love Syria! It used to be my #1 travel recommendation for ease of travel, friendliness of people, interesting things to see, etc. The people were absolutely wonderful! I don’t recall eating cauliflower, but the spices in this dish do sound quite familiar to other things I tried there. Thanks for sharing! Just came across your entry and it gave me goosebumps. My father owned an import/export company in the 90’s and one of his largest clients lived in Syria. Every time my father would return he’d bring brown paper bags filled with the best pistachios I’d ever eaten. Still to this day I wonder how he got them through customs…lol. One year, his client came to visit New York and brought his lovely wife. Me, my father and my step mother flew to meet them. Since my father had lived in New York for many years, he wanted to be their tour guide. It was the most amazing trip. The clients wife spoke Italian and Syrian but not English. My dad took us all to an Italian restaurant in Little Italy/Manhattan and you’d think she was home. Still to this day, it’s one of the most memorable trips! They were absolutely lovely and I think of them often. definitely m going to give a try..
And this dish, it’s honestly something I’d gladly have for dinner several nights a week. Absolutely perfect. Would you also share your poached egg recipe with us? Somehow it looks better than all the other poached eggs I’ve seen. How come the egg white looks a bit crunchy at the edges? Thanks for the cauliflower recipe, I made it yesterday for today’s lunchbox! Till now I used poached eggs as addition and the mixed in runny egg yolk is delicious! I’m looking forward to giving the lightly fried over version of yours a try as well. Keep up the good work! I stumbled across this recipe on Pinterest and I’m so glad I read the whole post. I got teary-eyed when you shared the wonderful hospitality of the Syrian people. I hope I have the chance to visit one day and that their beautiful county will be peaceful once again very soon. Made this for dinner tonight as a side. I used half broccoli and added shredded carrots. Delish! My husband loved it too! Thanks for the recipe! Faith, once again you have me weeping.Your story about Damascus just set off sooooooooo many memories, I can’t stop crying. The people are just so incredibly kind and hospitable. I remember so vividly one time we were in a big outdoor restaurant near the airport, “you most likely know where I’m referring to” and this woman approached me and my daughter and asked if we were American. Of course I said yes and she got soooo excited and just wanted to give us beautiful blessing and one day when my daughter gets married , she hoped she could come. The Syrians are one of the most friendly and beautiful people I’ve ever had the pleasure to live around. God Help Them.I feel so blessed to have been able to spend so much time there. Insha Allah “God Willing” one day I will go back to see my family. Until them they are always in my prayers. excellent! made according to recipe and will not change a thing! Thanks so much! Came across this randomly looking for healthy breakfast options. Loved the story about the Syrian restaurant in Kuwait. I used to live in Dubai and dated a Syrian. He took me to a Syrian restaurant and our first visit was almost exactly the same as you described! The hot bread, the veggies, the hospitality, the convo between my ex and the waiters, even down to the comped bill! We frequented often. His family is still in Syria, and the last time we spoke they were safe, but I also wrote a similar message to my friends and family about the empathy and compassion needed for their people and their country. Anyway, thought I’d share.